Herbaceous climber. Leaves simple, alternate, broadly ovate-cordate, more or less deeply palmatilobe, serrate, 5-10 cm across; petiole 3-6 cm long; tendrils slender. Flowers dioecious, solitary, bell-shaped, 1.5-2 cm long, 1-1.2 cm wide, with 5 ovate, acuminate lobes, white. Fruit a berry oblong-ovoid, 2.5-6 cm long, 3 mm wide. 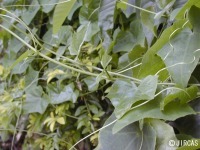 Common herb in waste, opened places, abandoned land, sometimes grown as hedge plants for edible young shoots. The tender shoots are an excellent vegetable served blanched with nam phrik(chili sauce), with noodle or fried. They can be used in kaeng liang or soup made with minced pork. 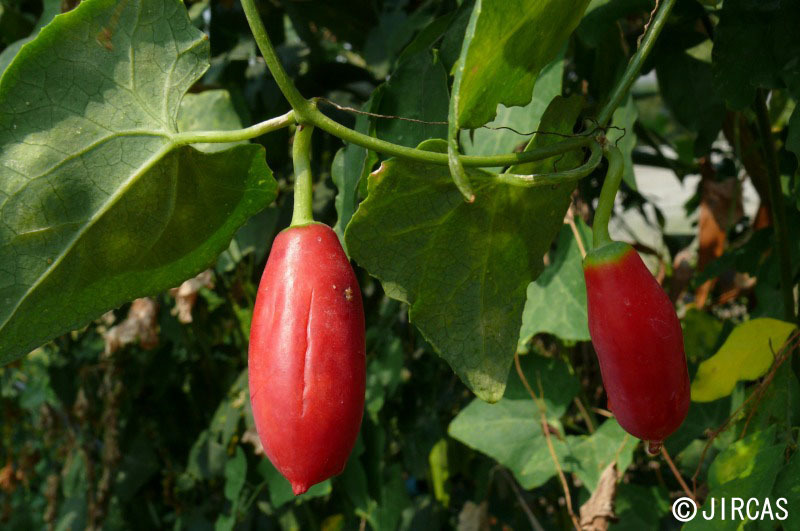 The young green fruit is also an ingredient in kaeng liang, while the fermented young fruit is mixed in soup, eaten with boiled rice or fried. This plant can be grown from stem cutting or from seeds. It prefers full sun and high organic, moist soil. Copyright© 2010 Thai Vegetables. All rights reserved.